Kusum Malik Post Graduate Scholar, Department of Post Garduate Basic Principles of Ayurved and Samhita, Shri Ayurved Mahavidyalya (Govt of Maharashtra Grant in Aid), Nagpur, Maharashtra, INDIA. Brijesh Mishra Professor & HOD, Department of Post Garduate Basic Principles of Ayurved and Samhita, Shri Ayurved Mahavidyalya (Govt of Maharashtra Grant in Aid), Nagpur, Maharashtra, INDIA. For true exploration and validation of Ayurveda in all its aspects, scientific inputs should confirm to Ayurveda’s basic principles and philosophy. Till date so many studies have been done for elaboration of fundamental principles like Tridosha, Dhatu, Strotas, Agni, Oja, Ama etc. No any rewarding work has been done on Panchamahabhuta Siddhanta and it is a still stalemate for us. In this perception, present attempt is enlightened on its basic concept and clinical application and its importance in Ayurveda. Ayurveda depends on the concept of Panchamahabhutas i.e. Aakaash, Vayu, Agni, Prithvi, Jala. The Panchmahabhut revolves around the normal functioning of the body (physiological), occurrence of disease (pathological) and action of drug in various part of the body (pharmacokinetics). According to Ayurveda this holistic approach comprises five elements of nature. The food, the planets and every living and non-living things are made up of these five elements. Tridoshas (Vata, Pita, Kapha) also comprises Panchmahabhuta. On the basis of thorough knowledge and understanding of Panchmahabhuta Siddhanta one can take an account of the causative factor of imbalance of Doshas and thereby discover the solution for the treatment. MALIK, Kusum; MISHRA, Brijesh. PANCHAMAHABHUTA - AADHARBHUT SIDDHANT AND THEIR APPLICATION IN CHIKITSA. 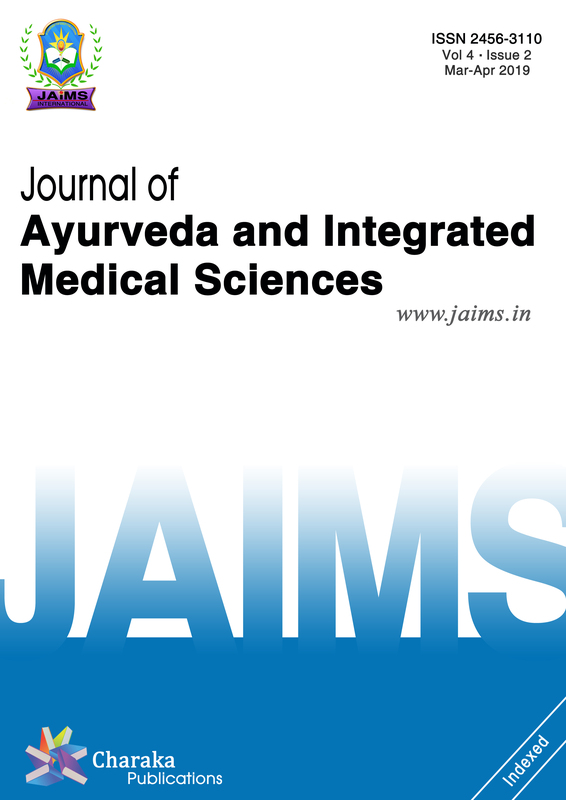 Journal of Ayurveda and Integrated Medical Sciences (ISSN 2456-3110), http://www.jaims.in/index.php/jaims/pages/view/Citation, v. 3, n. 5, p. 146 - 150, nov. 2018. ISSN 2456-3110. Available at: <https://jaims.in/index.php/jaims/article/view/708>. Date accessed: 25 apr. 2019. doi: https://doi.org/10.21760/jaims.v3i5.13833.